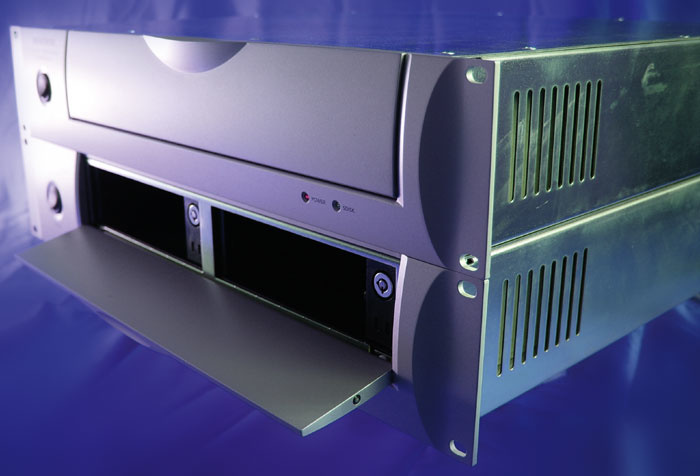 Soundscape have always been renowned for the stability of their DSP-based PC recording systems. Their latest development is a unique new way of integrating native CPU power into the Soundscape environment. Since we reviewed the Mixpander Power Pak and Mixtreme 192 in April 2005, Sydec have launched a number of new Soundscape products. These include several new iBoxes, allowing various new Mixpander Power Pak configurations with ADAT and AES-EBU compatibility added to the original MADI, analogue and TDIF options. They have introduced a new eight-channel microphone preamplifier, the iBox 8-MPA, which would typically be used to complement one of the 48 or 64-channel iBoxes, although it can also be used stand-alone. A new PCI audio card is also available: the Madixtreme, featuring two DSPs and 64 input and output channels via MADI, controllable from the Soundscape Mixer software. With the Madixtreme and MADI compatibility for six of the new-generation iBoxes, Sydec Audio Engineering seem determined to cover every angle in terms of MADI compatibility. They also introduced the MADI-OptiCoax, a simple way to convert a multi-channel signal between the optical and coaxial versions of the MADI format. These new products demonstrate a clear intent from Sydec to integrate their DSP technology ever more closely within the PC native world. This trend is also shaping the evolution of the Soundscape Editor software that controls their flagship DAW sytems. Soundscape Editor is now at version 5.0, allowing ever-closer integration between the Soundscape DSP-powered hardware and the PC-native world with the concept of virtual 'Native Soundscape Units'. 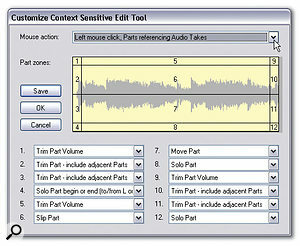 Soundscape Editor runs under Windows 2000 or XP and requires dedicated hardware to run; older systems such as the Soundscape 16 (16 tracks), and the R*Ed, R*Ed/24 and R*Ed/16 are compatible, but the only current product that will work with Soundscape Editor 5 is the Soundscape 32, a 2U-high rackmountable unit that connects to the host PC via a PCI card. The grey-painted aluminium front panel shares the elegant, curvy look of the new iBox series, but in this case it only features a Power button and a lid in the centre with two LEDs below it. Lowering the lid reveals two hard disk caddies (left). The Soundscape 32 requires only one hard disk to operate, but can house two hard disks in these removable caddies and a further two 'internal' hard disks below them (the unit needs to be opened to fit internal drives). Drives up to 137GB are supported at present, so a single Soundscape 32 can store up to 548GB of data. The main digital I/O format used on the Soundscape 32 is TDIF: 24 channels are available on three D-Sub connectors.The rear panel of the unit features a connector to link to the PCI Host Interface card, one stereo AES-EBU/S/PDIF input and two stereo AES-EBU/S/PDIF outputs on XLR connectors (the format is AES-EBU by default but can be switched to S/PDIF by means of internal jumpers), two balanced analogue inputs and four balanced analogue outputs on XLR connectors, three TDIF connectors for 24 inputs and outputs, word/Super Clock input and output on BNC conectors, MIDI In, Out and Thru ports, and an expansion port which can be used to connect a Mixpander/9 or Mixpander/5 multi-DSP PCI card. If the Soundscape Synchronisation board is fitted inside the unit, connections are also available for 9-Pin, VITC in and BITC out on BNC connectors and LTC in and out on phono connectors. The Soundscape Synchronisation board is an option and was fitted to the review model. The Soundscape 32 unit contains two DSPs. The 'Recorder DSP' controls the recording and playback of 32 audio tracks at up to 48kHz or 16 tracks at up to 96kHz. The 'Mixer DSP' powers the Soundscape Mixer, which is essentially the same as described in the Mixpander Power Pak review. A single Mixer DSP is enough to cover the basics for 32 audio tracks, but a Mixpander is necessary for any serious 'in the box' mixing job. When a Mixpander is present, mixing completely in Soundscape DSP is a totally realistic prospect. A Soundscape system can include up to four Soundscape 32 units running from the same software window. Each PCI Host Interface card can control two units, so two cards are enough to run four units. In a typical PC with six PCI slots, that would leave four slots for four Mixpanders in a 128-track system, though there is no obligation to have a Mixpander for each Soundscape 32. All this runs with zero load on the PC, but while Soundscape systems used to be sold on their superior reliability when compared to PC native systems, the latter have evolved and become a more serious proposition. Sydec have recognised this fact and developed ways to use the power of the host PC to enhance the Soundscape system even further. In fact, with version 5 of the Editor software, PC-based 'virtual units' can be added to hardware Soundscape units to create a bigger system with a higher track count. This requires a Mixpander to be present and I will expand on this later in the review. Essentially, the dividing line between DSP-powered and PC native systems is being blurred, in the same spirit that is behind the Mixpander Power Pak. The following file formats can be imported to or exported from Soundscape: WAV, BWF, OMF (requires optional OMF Import/Export plug-in), Pro Tools, MPEG Layer 3, MPEG Layer 2 (requires QDesign MPEG audio codec) and SDR (the format used by Mackie hard disk recorders). The first installation step is to insert card(s) in PCI slot(s) as required and let Plug and Play install the drivers. The PCI Host Interface card is small enough to fit in any PCI slot, but the Mixpander is a full-length PCI card, so if you intend to fit four Mixpanders it may be necessary to choose your motherboard carefully. The remark I made in the Mixpander Power Pak review about the shortness of the Mixpander cable also applies here, but the PCI Host Interface cable is slightly longer at five feet. Driver installation is totally straightforward. The latest version of the installation files can be downloaded from the Sydec Audio Engineering web site and the files are surprisingly small at 3.5MB in compressed format. If a Mixpander is present, Windows also requires WDM drivers when the Editor software is started for the first time. Again, installing these drivers is fast and easy. 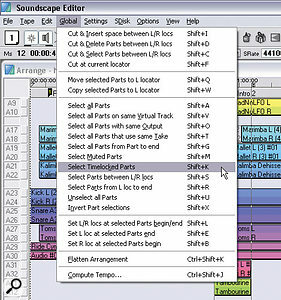 This screenshot shows the 'Edits — Vocal' Arrangement being dragged into the Arrange window. Prior to that, it can be listened to just by right-clicking the filename in the SFile Manager window (highlighted, right of picture). This is a very useful way of working with 'sub-arrangements'.The most striking aspect of the Soundscape Editor interface is its clarity, which is obvious as soon as the application's main screen is displayed. The Arrange window occupies most of the screen space. Unlike many audio editing and sequencing packages, the Soundscape Editor does not need a huge track column on the left, because it is organised around Parts in the Arrange window. There are no track parameters as such, because most editable parameters apply to the Parts themselves, and playback is handled through the Soundscape Mixer, with the Mixer Window only one click or key command away (or displayed on a second monitor). Right-clicking the Record Track Column, as the track column is known, pops up a menu that allows an audio or automation Record Track to be inserted. Record Tracks appear as colour-coded rectangles with a track arming button, and can be moved along the Record Track Column individually or in groups, deleted or reassigned. This is all you need for recording: everything else (routing, level monitoring and so on) happens in the Mixer. To the right of the Arrange window, the SFile Manager allows immediate access to the audio and automation Takes, ie. the actual chunks of audio and automation data that are recorded on the Soundscape hard disks and referenced by the Parts. 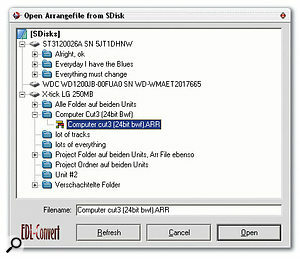 Editing is performed on the Parts in the Arrange Window and does not affect the Take data on the SDisks, but is reflected in the Arrangement file. Processing such as normalising or sample-rate conversion creates new Takes, but does not systematically delete the originals: you can set the program to delete the replaced Takes automatically, to pop up a dialogue box offering to delete them, or to keep them in all cases. The Menu, Tool and Status bars are at the top of the screen, the Transport Bar at the bottom. Other windows such as the Marker Directory, Big Current Time window, Video File Player, SDisk Window and so on can be called through the View menu or via key commands. 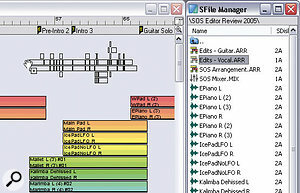 The SFile Manager, which by default is always displayed, allows immediate access to all stored audio and automation data. 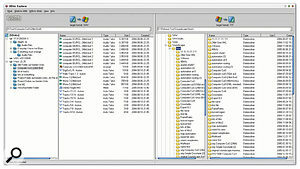 On the surface its organisation appears similar to that of Windows Explorer. However, it's a lot faster to use because a single folder can include files residing on any number of different drives. You may still use data from any number of folders in the same Arrangement. In that case, and if required, automatic commands allow you to move or copy all currently active files to the current folder, which is a good way to store everything in the same place before backup. The Customise Context Sensitive Edit Tool window. The tool selections displayed apply when the mouse pointer is on an Audio part. Different selections can be made for Automation parts, and for either part type when the Alt key is pressed, using the Mouse Action menu (top). The screenshot also shows how the Parts are divided into zones. Takes displayed in the SFile Manager can be dragged and dropped anywhere in the Arrange Window where they appear as Parts. Just press the Ctrl or Alt key to have them snap to their original (recorded) time code position or to the nearest locator respectively. Audio Takes can be auditioned simply by right-clicking their name in the SFile Manager, without loading them into the Arrangement. Playback goes on until the mouse button is released. This is a simple enough feature but there is more: this principle is extended to entire Arrangement files, which can also be listened to in this way without being loaded! Arrangements can also be dragged into the Arrange window and dropped at any time position, at a Locator position or at their original time position. This is especially practical when you edit multiple Parts to build a composite Part. However messy this can get on screen, when editing is finished it takes seconds to select the unused source Parts, save them as a 'mini-arrangement' and delete them from the current Arrangement to clear up screen space. If you change your mind later, drag the saved mini-arrangement back to its original time position within the current one and edit again. All editing and processing is carried out using tools: no need to go through menus to access the more advanced processing functions. Four tools can be simultaneously assigned to the mouse: one for each button, plus one more per mouse button when pressing the Alt key. So, although changing tools is easy because they are all displayed at the top of the Arrange window, you don't need to do it very often. The icons of the selected tools are also highlighted and underlined in black or in red, to the left or right, making it easy to check the current mouse button/Alt key assignments. All this sounds easy, but the Context Sensitive Edit Tool makes everything even faster. 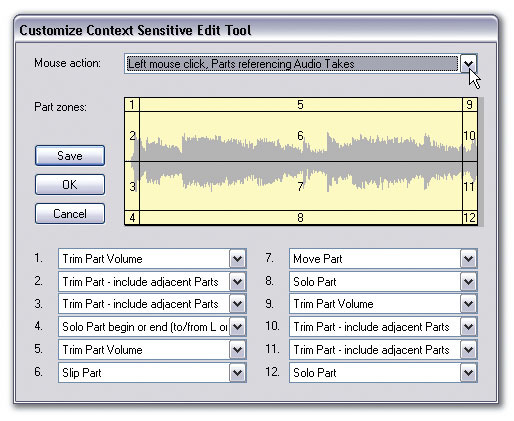 The Context Sensitive Edit Tool changes function according to the position of the mouse pointer on the Part you want to edit: the Parts are divided into four horizontal 'zones', plus special zones at the beginning and end of the Part. The mouse pointer icon changes according to the pointer's position on a Part to show you which tool is activated. There are 12 zones in total, and the assignment can be chosen by the user for each zone according to the Part type (audio or automation). On top of that, pressing the Alt key on the computer keyboard allows an alternate tool selection for each zone. This quickly becomes a very intuitive way to work, and since a picture is worth a thousand words, I have included a screenshot of the Context Sensitive Edit Tool's customisation window (below). This screenshot shows the many part-selection options of the Global menu, as well as some other global operations.It certainly makes editing lightning fast when the program changes tool for you automatically and appropriately according to the context! With, in effect, 24 different tools available for each type of Part at a single key-press, it feels as if the program second-guesses your every move, and generally gets it right. And since all these tools are available via the left mouse button, the right mouse button can be used for something else: pressing it calls up a pop-up menu that provides access to the other editing functions. So in theory, all your editing could be done using only the Context Sensitive Edit Tool. 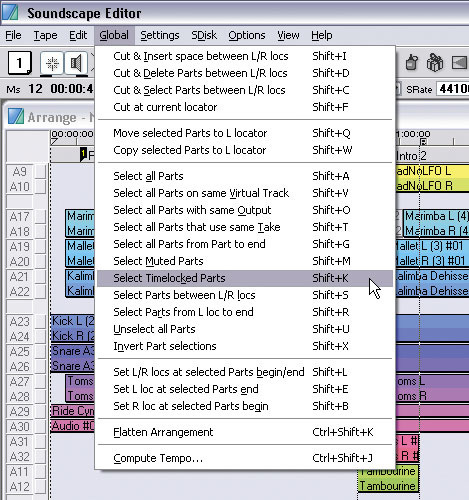 The 'global functions' accessed via a menu or key commands speed up editing operations that involve selecting a number of Parts. Using the commands in this menu, Parts can be selected quickly according to many criteria including their horizontal position in the Arrange window, their track assignment for the mixer and more, regardless of how distant they may be from one another in the Arrange window. Global operations can also be carried out for the whole Arrangement. All editing is carried out in the Arrange window. In this context, the zoom function needs to be particularly efficient — and in fact, it is so quick and convenient that I miss it when I using image editing packages! Clicking the Zoom Box or pressing the 'Z' key selects the Zoom tool, overriding the current tool selection (which is restored automatically as soon as you have zoomed). 'Rubber-banding' an event zooms in on it, while clicking anywhere in the Arrange window zooms in directly to sample level, which is generally a good way of getting lost! Successive views are automatically memorised and it is possible to navigate between memorised views in either direction (ie. to go back to earlier or later views) using simple key commands. The Mixer section of the Editor is very similar to the Soundscape Mixer software, which has been described in depth in the Mixpander Power Pak review, so I will just sum up its main features here. The Soundscape Mixer can be completely configured by the user. Mono, stereo, mono to stereo or multi-channel mixer strips can be inserted in any of the 128 columns. 'Mixer Elements' are then inserted in the order required in the mixer strips, though they can be moved around later. Mixer Elements include peak meters, EQ, faders, inputs, outputs and sends, sample delay lines, M&S decoders, mono and stereo track inserts and a range of DSP-powered plug-ins. The Audio Toolbox plug-ins are supplied free of charge by Sydec with new systems, and include Delay, Chorus/Flanger, Dynamics Processor and Dither. Other plug-ins are available from third parties such as Drawmer, TC, Aphex, CEDAR and more. VST and VST Instrument plug-ins can also be inserted in the Soundscape Mixer strips when a Mixpander is present. The PC-native plug-ins run on the host PC's processor and the Mixpander's audio streaming capabilities allow the audio data to be transferred between the Soundscape system and the PC. The streaming process is fully automated and does not require any input from the user. This leads me neatly to the next section, where I will describe the Mixpander and how version 5.0 builds on the Mixpander technology to create a DSP/PC-native hybrid system. These days, the Mixpander is available as a component of the Mixpander Power Pak, but it was originally developed as a co-processor for non-native Soundscape DAWs. 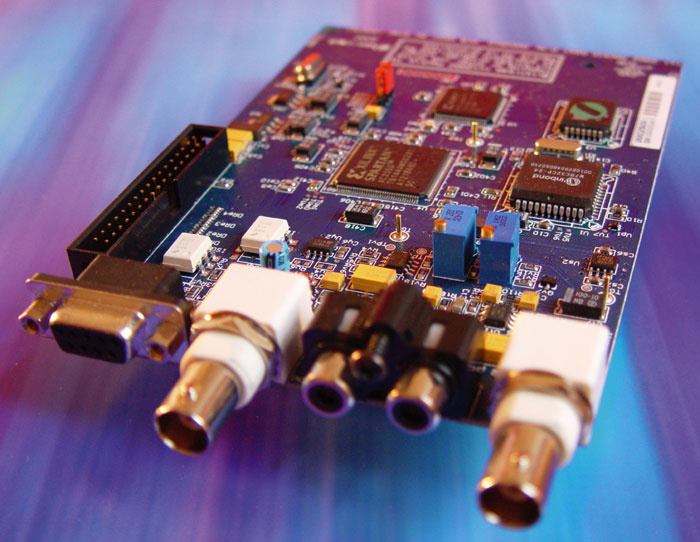 It's a PCI card that sits in the host PC and connects to the Soundscape hardware via a proprietary TDM expansion buss. With five or nine on-board DSPs depending on the model, it adds a tremendous amount of mixing power to the system — and with multiple hardware units, you can also use multiple Mixpanders. In parallel, it also appears to the PC as a soundcard which allows audio streaming between the Soundscape Mixer that runs on the Mixpander DSPs, and PC-native applications such as software instruments, sequencers and so on. When used with a Soundscape 32 system, the Mixpander allows 48 channels of streaming in both directions at up to 48kHz, or 32 channels in both directions at up to 96kHz; note that this is less than in a Mixpander Power Pak configuration, obviously because a proportion of the Mixpander's routing is dedicated to the audio tracks from the Soundscape hardware. The Mixpander drivers support MME, WDM, GSIF, ASIO 2 and DWave and are multi-client. This means that in addition to your Soundscape Arrangement, you could for instance route audio from Gigastudio (GSIF) and SAW Studio (DWave) into the Soundscape Mixer simultaneously. In version 4.x of the Editor, the Mixpander's streaming capabilities were used to integrate VST and VST Instrument plug-ins to the Soundscape Mixer: the audio is routed to and/or from the PC's processor at high speed and as required for VST processing or VST Instrument performance. With version 5.0 of the Editor, this same capability is used to run 'Native Soundscape Units'. The Soundscape 32 comes with MIDI ports and supports MTC as chase or trigger slave, and MTC or MIDI Clock as master. With the optional Soundscape Synchronisation Board (right), Soundscape can receive LTC and VITC and transmit LTC and BITC. It also supports 9-pin operation with three 'master' modes (Controller, Layback, Synchro) and one 'device' mode. Version 5.0 adds ASIO Positioning Protocol (APP) compatibility. This allows APP-compatible applications such as Cubase and Nuendo to lock to the Soundscape Editor with sample accuracy without any MIDI connection. A Mixpander is required for this functionality, and a Mixpander audio stream must be referenced by the APP-compatible application. Soundscape is a modular system. Originally, up to four hardware DAW units could be combined to increase the system's track count, I/O and data storage capacity. With version 5.0, 'Native Soundscape Units' can also be combined with hardware Soundscape units. A Native Soundscape Unit is a 'semi-virtual' unit that runs on the host PC. It's not completely virtual, because each virtual unit needs at least one SDisk (Soundscape-formatted hard disk) to be mounted in the PC, either connected to a motherboard IDE port or via a Firewire or USB IDE enclosure. Virtual units do not have a 'recorder DSP' for recording, playback and processing: instead, the whole Soundscape audio engine has been translated to run on PC processors. This also means that the same processing tools can be powered either by the DSPs of the Soundscape hardware or by the PC processor, although this is not apparent to the user. The main difference between hardware units and native units is that native units do not provide any inputs and outputs. They are only connected to the outside world via 'Native Track Inserts' that can be placed as required in the Soundscape Mixer. These Native Track Inserts use the Mixpander's native streaming channels, just like VST and VST Instrument plug-ins. Given the flexibility of the mixer's architecture, it's easy to route external audio that enters the system via the I/O of a Soundscape hardware unit to a native Soundscape unit. In this example mixer, both mixer strips run on the same hardware unit. A native unit is accessed via mixer strip 2, which also features three VST plug-ins. First, a stereo native track insert routes audio to and from tracks 33 and 34 on the native Soundscape Unit. The signal is then routed through three VST plug-ins, and a second native track insert allows the wet signal to be recorded to the native unit. After that, the audio is routed back to the DSP-powered system, where reverb is applied. Since the native mixer elements are inserted consecutively, only two streaming channels are used in each direction (to and from the PC). When the mixer configuration is created, inserting native mixer elements is just as straightforward as inserting DSP-based mixer elements. All native elements are cloloured in blue for quick identification in a large mixer.The total number of hardware and native units in a system is currently limited to four, and if units with a different track count are combined in a system, all units are limited to the track count of the smallest unit; for instance, if three Soundscape 16s and one Soundscape 32 are used together, the Soundscape 32's track count is reduced from 32 to 16. In theory, version 5.0 thus allows a combination of one Soundscape 32 and three 32-track native units. However, note that since the audio tracks from the Native Soundscape Units are routed to the Soundscape Mixer via the Mixpander native streaming channels, and since each Mixpander provides a maximum of 48 streaming channels, there are limitations on how 96 native tracks could be used. Realistically, with a single track insert per mixer strip, a Soundscape system comprising one Soundscape 32 and two native units can provide 80 tracks. Extra native tracks could still be used in particular cases (when several native track inserts are inserted consecutively in the same mixer strip, no extra streaming channels are used). The fact that no extra native streaming channels are used in case of consecutive native mixer elements in the same mixer strip also means that using the native streaming channels for native track playback does not, in practice, limit the number of VST plug-ins that can be used. In fact, it makes it possible to work very effectively in a PC-native environment and a DSP-powered environment at the same time! 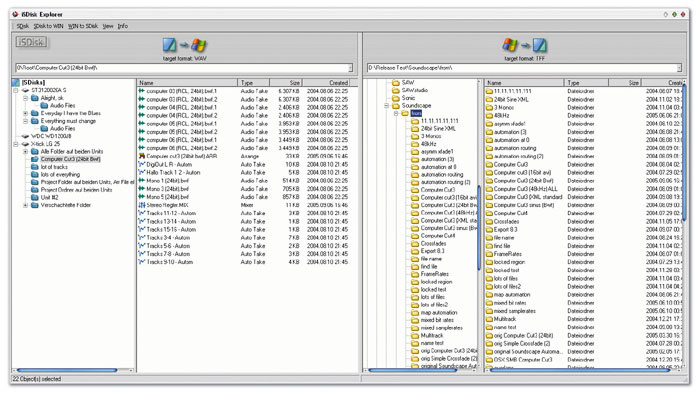 Although the native Soundscape SDisks are connected to the PC, their contents are displayed in the SFile Manager exactly as for SDisks mounted in Soundscape hardware units. In fact, while native SDisks are seen by Windows and displayed in the Windows Device Manager, they cannot be accessed via Windows Explorer. However, I found that file transfer speeds between 'Windows-based' drives are nearly 10 times faster to and from a PC-mounted SDisk than to or from SDisks mounted in a Soundscape hardware unit. This makes it easier than ever to transfer projects between Soundscape and other platforms. I must admit that I was initially rather sceptical about running the Soundscape Editor on generic PC hardware. While using Soundscape cards for I/O and DSP-powered mixing in a native environment (as with the Mixtreme 192 or Mixpander Power Pak) makes complete sense, the Soundscape DAW philosophy was always about high-quality, dedicated audio hardware. The PC was originally being used only for display purposes, because a large screen makes editing easier. So how does version 5.0 fit in with this philosophy? First, it should be pointed out that while the system now supports virtual native units running on the PC, it is still possible to run the system entirely on the DSP-powered hardware. This will surely remain the preferred choice in recording or live situations, or in situations where the PC is used for other tasks such as video editing. Second, and this is possibly the most important point, native Soundscape units still respond just like Soundscape hardware units, with zero-latency recording and playback. This can be achieved because even though native track inserts, just like other native mixer elements (VST plug-ins), are subject to a buffer, Soundscape's native audio engine entirely compensates for the buffer size even when the Automatic Delay Compensation is switched off. The Soundscape system also accesses the native SDisks via low-level Windows direct disk access functions, whereas fully PC-native packages use high-level Windows file I/O functions. This makes for possibly the most efficient audio engine currently available on the PC. In fact, the buffer size can even be set to a high value (1024 samples or higher) for absolutely glitch-free playback, while retaining latency-free recording and playback and real-time record monitoring. Third, in the case of native units, the only hardware elements that are transferred to the PC are the SDisks. The hardware components that are most critical to the system's sonic performance, namely the physical inputs and outputs, are still located outside the PC and powered by a robust power supply designed specifically for audio applications. After using a native Soundscape unit alongside hardware Soundscape units, I am totally convinced of the viability of such a system. My only reservations are that installing a native unit requires tweaking an initialisation file, which is easy to do, but out of character given the overall user-friendliness of the program. Also, since native units are accessed via native track inserts running on DSP-based mixer columns, transferring projects between different Soundscape systems that combine various numbers of hardware and native units may require some editing of the mixer configuration. However, these remarks should be seen in context: overall, the system is highly efficient and the advantages of version 5.0 largely outweigh these small drawbacks. With regards to software processing, computers have been catching up with DSP hardware. They also offer speed advantages when it comes to faster-than-real-time processing. DSP-powered systems retain numerous advantages of their own: latency is so low as to be largely irrelevant (comparable to digital mixing consoles), and since the DSP hardware handles all the audio tasks and nothing else, with little or no influence from the host computer, the latter can be used for other duties and, in any case, does not need to be tuned up specifically for audio work or restricted to running a limited number of programs. In my experience, DSP-powered Soundscape systems do not suffer glitches, whatever happens in the computer. In fact, some Soundscape systems have been known to continue playing back perfectly even when the host computer crashes for unrelated reasons! The EDLiSD and iSDisk Explorer utilities makes for easier, quicker and more versatile transfers between Soundscape and other formats.With version 5.0, Soundscape systems can now offer the best of both worlds. They can be run entirely on DSPs when the host PC is underpowered or used for other tasks such as professional video editing, or when reliability is crucial, for instance in live playback/recording situations. Yet, when it comes to mixing down an audio project, the native-plus-DSP 'hybrid' mode allows extra audio tracks and easy access to VST plug-ins in addition to Soundscape-format DSP-powered plug-ins. The power of the computer is therefore available to the Soundscape system, but the Soundscape system does not depend on it. This is certainly a major evolution for Sydec as a company and for Soundscape users, and opens up a whole new range of possibilities. For a start, it allows current Soundscape DAW users to at least double their track count for a very modest financial outlay: the price of an IDE drive, plus the v5.0 update, for an extra 32 tracks. Further tracks can be added by just creating further native units (ie. adding IDE drives to the PC). From Sydec's point of view, it means that the company have translated the Editor code to run on a PC processor with regards to recording, playback and sound processing, thus creating a PC-native audio engine that offers a level of performance comparable to its DSP-powered DAW systems, due to particularly efficient coding and the close cooperation between the Soundscape Editor and proprietary Soundscape drivers. Sydec also claim a highly efficient multi-processor load-spread, although my test PC did not allow me to check this aspect. I can, however, confirm that a native unit running on my humble 1GHz Pentium III behaved just like an extra hardware Soundscape unit in terms of recording and playback, even though the same computer struggles to play back a dozen tracks using a PC-native audio sequencer (this PC is not specifically configured for audio, which only illustrates the point that the PC's own configuration and any tasks it performs simultaneously have little effect on Sydec's new native audio engine). Sydec appear totally committed to hybrid DSP/native solutions and this is also starting to show in their hardware product line: the new iSDisk 4F unit is a Firewire housing that can host up to four IDE drives (native SDisks). 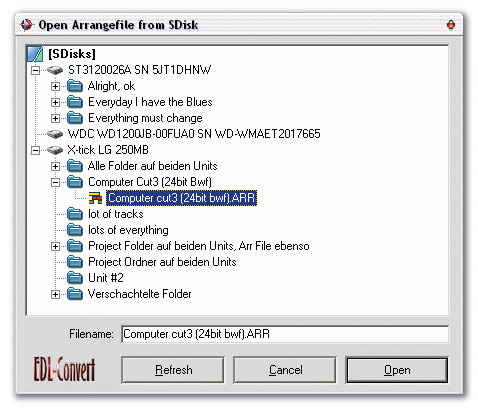 On the software front, the iSDisk Firewire can be complemented by EDLiSD, a specially developed version of Cui Bono's excellent EDL Convert software. While file transfers can normally be performed by clicking and dragging from Windows Explorer to the Soundscape SFile Manager, exporting from Soundscape has to be done via the Editor's File menu. Format conversion can be performed at the same time as importing/exporting but the range of supported formats is limited (although, usefully, Pro Tools project compatibility is included as standard). EDLiSD includes the iSDisk Explorer module, a two-pane window which can display the contents of PC-mounted SDisks and the contents of Windows-formatted disks. Files can be exchanged between SDisks and other drives, and format conversion can take place at the same time. Conversion speeds are faster when using EDLiSD, and it supports a very wide range of formats including Samplitude/Sequoia, Vegas, Vegas Scripting, Cool Edit Pro, Audition, SAW, SAW Studio, Wavelab, Sadie, Sonic Studio, Discreet, AES31, OpenTL, OMFI, Tascam BU, CMX/GVG and Pro Tools 5. For current users of Soundscape DAWs, version 5.0 has a lot to offer, providing they have a Mixpander (and Sydec offer Mixpander and version 5.0 upgrade bundles for those who do not yet own a Mixpander), and further v5.x releases are bound to add a greater number of smaller features. For potential buyers who are considering a Soundscape system, version 5.0 makes it an even more attractive proposition. The quality and reliability of dedicated hardware remains a strength of the system, which can still run exclusively on DSPs for recording, playback and processing. Yet, where appropriate, the power of the host PC can be harnessed with latency-free recording/playback and real-time record monitoring of PC native tracks, along with VST and VST Instrument integration (which were already implemented in v4.x). On a day-to-day basis, the hardware will just run in the background, while the user interface will determine how enjoyable the system is to work with. The Soundscape Editor software scores very highly in this respect. The learning curve is very short, the design clear and uncluttered, the operation fast and accurate. As with any system of this standard, there is a lot of depth to explore if you want to learn every possible trick and shortcut, but you can get up to speed very quickly in terms of dealing effectively with any kind of work in a professional context. And finally, all the positive points I mentioned in last year's Mixpander Power Pak review also apply to the Soundscape/Mixpander combination. In particular, the flexibility of the fully user-configurable mixer and the enormous mixing and processing power provided by such a system are hugely impressive. Fast, easy and efficient editing. Latency-free recording, playback, monitoring, mixing and processing. Integration of DSP and PC native power. Some initialisation file tweaking is required to install native units. Project transfers between different Soundscape system configurations may require some editing of the mixer configuration when native units are used. If your work is strictly audio, or even if it is mainly audio and you are prepared to run a MIDI sequencer alongside Soundscape when required, then Soundscape has to be one of the most practical and efficient solutions around. Basic Soundscape 32 system 3995 Euros; Soundscape 32 with Mixpander/9 (as reviewed) 4995 Euros; Editor v5 upgrade from v4 99 Euros; upgrade from v3.0 and earlier 149 Euros. Prices include UK VAT; see Sydec's web site for details of other bundles and products. Soundscape worldwide sales +32 3 765 0098.